More than mere eye-candy, these fine specimens are potential suitors with real substance. Undeniably dark and handsome, it’s hard not to fall for their good looks even at a glance, but there’s so much more to love in each tempting crumb. Want a partner who won’t insult your intelligence? These fellas are a smart choice, made of high-fiber coffee flour and bolstered by whole wheat, staying with you all morning when so many flaky pastries will let you down. Seeking a bit of adventure in the everyday? Subtly fruity, nutty, and lightly scented with rich cinnamon, each bite provided a flavorful departure from the typical breakfast baked good. Prepare to meet your perfect match, at least when it comes to sweet muffin romance. Preheat your oven to 350 degrees and lightly grease 12 muffin tins. In a large bowl, sift the white whole wheat flour, coffee flour, baking powder and soda, cinnamon, and salt. Stir to combine and thoroughly distribute all of the dry goods throughout the mixture. Separately, mix together the non-dairy milk of your choice, brown sugar, vinegar, and oil. Pour the liquids into the bowl of dry ingredients, stirring lightly just to bring the batter together. Add the dates and pecans last, folding them in gently. A few errant lumps in the dough are perfectly fine. For the crumb topping, simply stir together all of the ingredients with a fork until the mixture clumps together in large pieces, approximately the size of peas. Distribute the muffin batter between your prepared tins, mounding them generously towards the center. Sprinkle the crumb topping over each one as evenly and equally as possible. Bake for 20 – 24 minutes, until a toothpick inserted into the center pulls out clean. Let cool completely before enjoying! It just might be the greatest berry you’ve never heard of. Limited to very small regions of Europe and North America, the Jostaberry is a specialty fruit that you won’t find in supermarkets any time soon. Delicate to a fault, they’re difficult enough to pick by hand without crushing or bruising. Unsurprisingly, no machines have been invented to make them a commercially viable option. Moreover, their prime harvesting season passes in the blink of an eye, encompassing two weeks each July at the most. Perhaps this very elusive nature adds to their allure, but I’d wager that they’d fly off the shelves should they ever become as common as apples and oranges. Luck was simply on my side when I discovered that Lyman Orchards, supposedly the one and only source on the east coast, had them ripe for the picking. In a class of their own, the Jostaberry is a cross between a black currant and a gooseberry, explaining some of their tart, slightly astringent qualities. Pronounced with a “Y” as a reflection of their German heritage, “Jostaberry” is a portmanteau that comes from a blend of Johannisbeere and Stachelbeere– The German words for both aforementioned varieties. When fully ripe, their sweetness develops further, blending in notes of blueberries, kiwis, and grapes, all into one tiny, juicy bite. Easily eaten out of hand, the real challenge is picking- and saving- enough to weave into recipes later. Their high pectin content makes them ideal for jams and jellies, but by the time I got back home from the fields, not even half the volume of berries I had intended for baking remained. Jam was out of the question for this season, but my precious Jostaberries became the stars of the show inside classic crumb muffins instead. Moist and bursting with that unique berry flavor, it’s no secret that the muffins themselves are merely vehicles for consuming large clumps of the dark drupes at once. Moist, soft and lightly buttery, the surrounding batter provides a gently sweetened backdrop that allows the berries to take center stage. The only thing that might improve the combination is perhaps a quick jaunt through the toaster oven, followed by a thick smear of that jam I had dreamed about… But that pairing will just have to wait for the next limited harvest. Preheat your oven to 400 degrees and either lightly grease or line 12 standard muffin cups with papers. Prepare the topping first by stirring together the brown sugar, flour, and almond meal in a small bowl. Drizzle in the melted coconut oil while mixing with a fork, until all of the crumbs are moistened and sticking together in coarse clumps. Set aside. For the body of the muffins, pull out your blender or food processor, and toss in the sugar, banana, lemon juice, and water. Thoroughly puree, until completely smooth, before adding in the melted coconut oil, non-dairy milk, and vanilla extract. Blend once more to fully incorporate. Sift the flour into a large bowl along with the baking powder, baking soda, and salt. Add in the jostaberries and toss to coat with the dry goods, which will help prevent them from sinking to the bottom of the muffins while baking. Pour the liquids from your blender into the bowl, and stir lightly with a wide spatula, just to combine. Don’t go crazy about getting out every last lump; a bit of unevenness is just fine. Equally distribute your batter between your 12 prepared muffin cups, mounding them up slightly towards the center, and then do the same for the crumb topping. It may seem like a whole lot of crumb, but don’t be shy and pile it on! Bake for 5 minutes, and then without opening the oven, reduce the temperature to 375 degrees. Bake for an additional 13 – 16 minutes, until a toothpick inserted into the center of a muffin comes out clean. Let cool completely before enjoying. For the sake of argument, let’s just say that you have a garden still overflowing with fresh mint, and for some odd reason or another, you recently bought an entire case of green pea flour on whim. Crazy scenario, I know, but humor me for a moment here. Managing those two surpluses separately would be completely possible, but a wasted opportunity. What combination has stood the test of time better or longer than mint and peas, after all? Bright, sprightly peppermint seamlessly works its way not only into every viable crack in the soil, but also every dish in the kitchen, effortlessly jumping from sweet to savory and back again. That lively punch of flavor is just what an odd-ball ingredient like pea flour needs to shake off its shyness and triumphantly emerge from the pantry once more. A prime breakfast, brunch, or side dish option, the fluffy yet sturdy crumb of these muffins will make you forget all about mum’s traditional mushy peas. Pops of subtle sweetness from whole green peas balance out this savory affair, while the pea flour keeps the flavor front and center through every bite. Lightly buttery and surprisingly rich, you’ll forget all about the abundant whole grains and vegetables sneaking in at the same time. Keep a stash of these satisfying little quick breads frozen, ready to defrost and serve in an instant, and you’ll never again struggle to finish your peas at dinner. Preheat your oven to 375 degrees and lightly grease a standard-sized muffin tin. Set aside. In a large bowl, whisk together the pea flour, white whole wheat flour, minced mint leaves, baking powder and soda, salt, and black pepper. Once all of the dry goods are thoroughly mixed, add in the thawed green peas and lightly toss them to coat. This will prevent them from sinking to the bottom of the muffins later on. Separately, mix the non-dairy milk, oil, melted margarine or coconut oil, agave, and vinegar. Once combined, pour the wet into the bowl of dry ingredients, and use a wide spatula to incorporate. Stir just until a smooth batter forms, being careful not to over-mix. 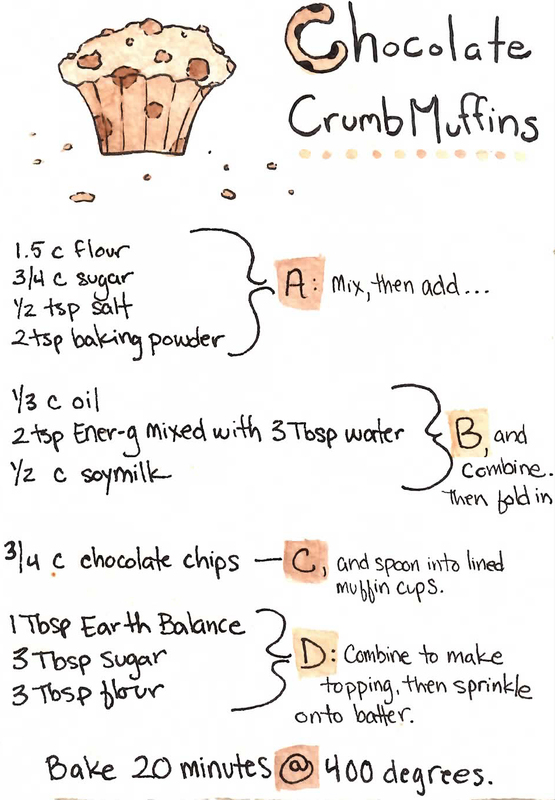 Divide the batter evenly between 9 – 10 muffin prepared cups, depending on how tall you want your muffins. Bake for 16 – 20 minutes, until golden brown on top and a toothpick inserted into the centers pulls out cleanly. Let cool in the pans for 10 minutes before transferring to a wire rack. Eat warm, cool, or freeze for future enjoyment. Wrapped up in soft long sleeves and knee-high socks, the night air still felt unseasonably harsh. Pumpkins and butternut squash looked like aliens in the produce department, suddenly materializing out of nowhere. Have they always been quite so orange, or so large? A year is a long time to go without seeing a close friend, and any small change (or constant, for that matter) seems magnified to outlandish proportions. Considering that it’s now mid-September, the annual shift in temperatures and available vegetables is right on schedule, but it’s me that is behind the times. Nightfall comes to earlier, too, and the air is much too dry. Autumn is no doubt a beautiful time of year with many good aspects to look forward to, but I’m just not ready to embrace it yet. There are still cherry tomatoes ripening in the garden, for crying out loud! But fall waits for no one; an impatient and demanding guest at best. Unwilling to dive into the deep end right away, a gentle dip into the season sounded like a more comfortable approach. One toe at a time, feeling out the waters, trying hard to settle in no matter how swift the current. Passing the squash for now, I moved on to a long-forgotten bag of flour in my pantry that seemed like an easier way to greet autumn. Yes, flour: Mesquite flour, to be precise. Mesquite flour isn’t seasonal per se, but it has cooler weather written all over it if you ask me. Mesquite reminds me of autumn because it has a warm, toasty flavor, reminiscent of a crackling, smokey wood fire in the fireplace. That rich, earthy scent that fills the air as the smoke rises up through the chimney and is whisked away with the brisk breeze; That’s what I think of every time I open up that bag of flour and inhale deeply. Just like that, I’m feeling warmer and lighter in spirit already. Turning on the oven never felt more satisfying. After nearly record breaking stretches of silence over the summer, it creaked grumpily back to life before returning to a contented purr. Something simple and comforting was in order, and I knew just the thing. Muffins, inspired by those made by Amanda Chronister (previously of Vegan Core) as part of a swap practically a lifetime ago, sounded like a tender and sweet vehicle for this dark, warm flavor. Continuing to tweak as I went, the muffins became anything but the simple crumb-topped treats I had first envisioned. Coffee took the place of soymilk and cacao nibs made a crunchy companion to the chocolate chips, further enhancing the roasted essence of the mesquite. Ending up with something entirely different from the inspiration, I was happy nonetheless to still have found the original recipe, still as cute and carefully drawn out as ever. While mesquite may not be an everyday sort of ingredient, it’s worth the pantry space when it can deliver such a unique and satisfying flavor as this. Preheat your oven to 375 degrees, and either lightly grease or line 10 standard muffin tins with cupcake papers. Set aside. In a large bowl, whisk together the both flours, sugar, ground flax, baking powder, salt, and cinnamon. Toss in the chocolate and cacao nibs, and mix lightly to coat the pieces with flour. Separately, stir together the oil and coffee before pouring both into the bowl of dry goods. Stir just enough to combine and create a mostly smooth batter. Distribute the batter equally between your prepared muffins tins, and lightly sprinkle the tops with turbinado sugar. Bake for 15 – 18 minutes, until a toothpick inserted into the center pulls out clean. (Make sure that gooey chocolate chips don’t trick you into over-baking the muffins!) Let cool in the pan for at least 15 minutes before letting them come to room temperature on a wire rack. Stubborn as ever, the lack of spring vegetables and 30-degree sunshine doesn’t deter me from celebrating the premature arrival of the new season. Besides, the tiny buds of crocuses are already beginning to peer up from the tender, half-frozen earth, and that’s reinforcement enough for me. Turning to the only edible that’s is reliably and unfailingly available so early in the season, the fridge has been stocked to the brim with fresh herbs. Mint, parsley, dill, basil, cilantro (even though it tastes like soap to my taste buds)- I don’t think there have ever been so many choices of flavorful greenery on hand at one time. Without a solid plan, it was merely a stroke of luck to see the savory cheese and chive bread being created by bloggers following along on the French Fridays with Dorie group. Even luckier, however, was the fact that I actually had good tasting vegan cheese on hand. Clearly, this one was meant to be. Because everything is better in cute little individual portions, I fashioned my bread into muffins, while bumping up the herb content to accommodate my vast selection. A cross between a light muffin and a fluffy biscuit, even I was impressed with how well this off-the-cuff adaptation came out. Moreover, I couldn’t help but be surprised at how much I truly enjoyed that elusive “cheese” factor. Yes, it’s true: I’ve officially been won over by Daiya. Any vegan cheesy shreds would do, of course, but Daiya has definitely found a fan in me. Plus, even the omnivores approved of the cheddar-y ribbons strewn throughout, so that’s got to say something. Both rib-sticking and fresh tasting, thanks to that vibrant herbal addition, these muffins managed to strike that fine balance between seasons that I’m still struggling with myself. Any combination of herbs would likely work just as well, so don’t be afraid to switch it up if you don’t have these exact greens on hand. Preheat your oven to 375 degrees, and lightly grease 9 – 12 medium muffin tins. In a large measuring pitcher, combine the non-dairy milk, oil, and vinegar. Stir well, and let sit for at least 5 minutes for the “milk” to curdle. Meanwhile, in a separate bowl, whisk together the flour, baking soda and powder, salt, paprika, and pepper, making sure that all of the ingredients are distributed evenly throughout the mixture. Add in the “cheese,” chopped herbs, and walnuts, and mix well. Pour the pitcher of wet ingredients into the bowl of dry, and use a wide spatula to bring the two together, stirring as few times as possible to create a mostly smooth batter. A few lumps are just fine, and certainly beat an over-mixed, tough dough. Scoop the batter into your prepared muffin tins, mounding it up in the centers. Depending on how large you want you muffins, fill the tins either just to the top, or pile the batter on well over the rim. Naturally, I like my muffins big and bountiful, so I got fewer out of the mix. Move your muffin tin into the oven, and bake for 16 – 20 minutes, until a toothpick inserted into the centers comes out clean and dry. If the muffins seem slightly anemic at that point, just run them under the broiler for 1 – 3 more minutes, until nicely golden brown. Let rest in the tins for 10 minutes before transferring to a wire rack to cool completely. Serve warm or toasted, along side a hearty bowl of soup, stew, or just with a faint smear of buttery spread.